Вы ищете хорошее предложение в сети интернет для того, чтобы заработать деньги. Мы ищем достойных партнеров, которым мы сможем доверять. Если Вы читаете это, значит время поисков закончилось! Настало время решительных действий и плодотворного сотрудничества с ACTELLA! 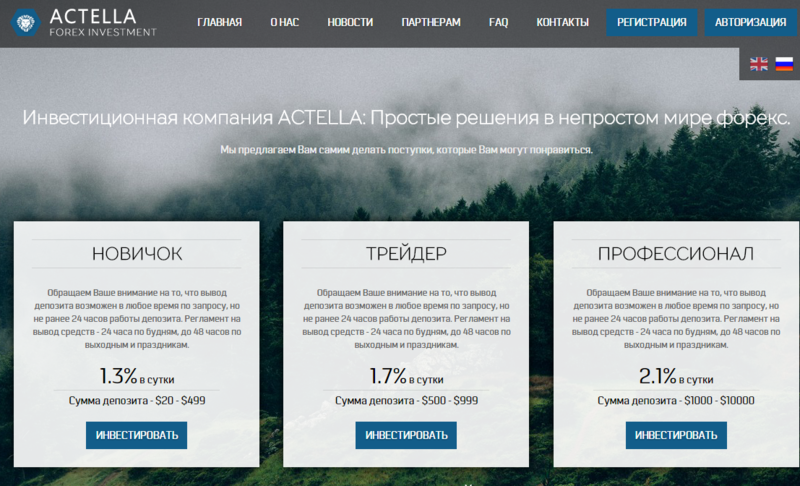 ACTELLA – хорошее время и место для того, чтобы стать свободным и преуспевающим человеком! 03.29.15 17:08	Account	Transfer	-150.00	Sent Payment: 150.00 USD to account U7479467 from U4731311. Batch: 85194259. Memo: Shopping Cart Payment. Deposit to actella.com User monitorinvestnet. 03.30.15 18:20 Account Receive +1.95 Received Payment 1.95 USD from account U7479467 to account U4731311. Batch: 85287857. Memo: Shopping Cart Payment. Withdraw to Monitor Invest Net from actella.com. 03.31.15 18:01	Account	Receive	+2.25	Received Payment 2.25 USD from account U7479467 to account U4731311. Batch: 85386225. Memo: Shopping Cart Payment. Withdraw to Monitor Invest Net from actella.com. 04.01.15 18:12	Account	Receive	+1.95	Received Payment 1.95 USD from account U7479467 to account U4731311. Batch: 85640953. Memo: Shopping Cart Payment. Withdraw to Monitor Invest Net from actella.com. 04.02.15 18:22 Account Receive +1.95 Received Payment 1.95 USD from account U7479467 to account U4731311. Batch: 85739875. Memo: Shopping Cart Payment. Withdraw to Monitor Invest Net from actella.com. 04.03.15 19:02 Account Receive +1.95 Received Payment 1.95 USD from account U7479467 to account U4731311. Batch: 85830008. Memo: Shopping Cart Payment. Withdraw to Monitor Invest Net from actella.com. 04.04.15 18:27 Account Receive +1.95 Received Payment 1.95 USD from account U7479467 to account U4731311. Batch: 85902906. Memo: Shopping Cart Payment. Withdraw to Monitor Invest Net from actella.com. 04.05.15 19:48 Account Receive +1.95 Received Payment 1.95 USD from account U7479467 to account U4731311. Batch: 85973035. Memo: Shopping Cart Payment. Withdraw to Monitor Invest Net from actella.com. 04.06.15 20:24	Account	Receive	+1.95	Received Payment 1.95 USD from account U7479467 to account U4731311. Batch: 86054554. Memo: Shopping Cart Payment. Withdraw to Monitor Invest Net from actella.com. 04.08.15 12:04	Account	Receive	+1.95	Received Payment 1.95 USD from account U7479467 to account U4731311. Batch: 86189486. Memo: Shopping Cart Payment. Withdraw to Monitor Invest Net from actella.com.